How cool is this? 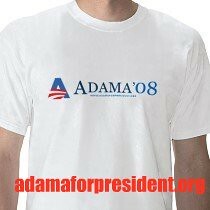 I just got a call from a respected colleague that a fixie bike rider at Duboce and Guerrero here in SF was wearing one of my awesome Adama for President shirts. That just like totally made my afternoon. Fixie bike rider, whoever you are, you rock. For more fun, why not visit the Adama for President site, or check out our Facebook group!